Illinois’ historic Fort Kaskaskia and Camp River Dubois at the mouth of the Wood River on the Mississippi were critical to the success of the Lewis and Clark and Corps of Discovery expedition. They were the foundation upon which the captains molded the corpsmen into an unstoppable force that blazed a trail to the Pacific Ocean. This is where it all began, and you can relive history and discover America the Beautiful as you circle on and off the trail in Illinois. 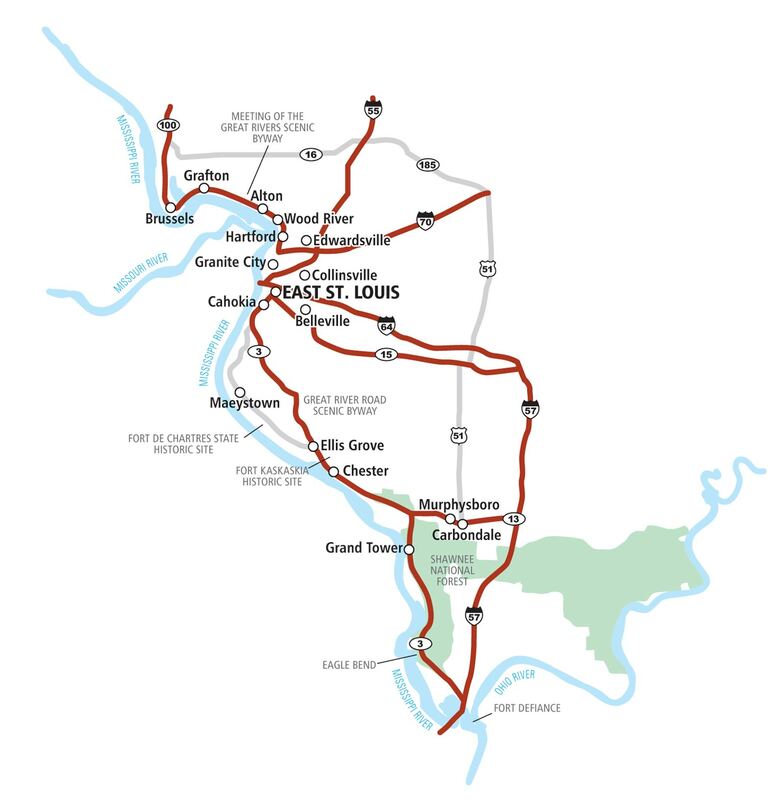 The Lewis & Clark route along the Mississippi River following the Great River Road Scenic Byway. Visitors in the Cairo area who are traveling north on the Mississippi will enjoy the great views, woodland trails and fishing at the park at the mouth of the Ohio River. Fort Defiance was once the site of a key Union outpost near Cairo during the Civil War. The Cairo Customs House Museum, the Magnolia Manor and Riverlore Mansion are popular. 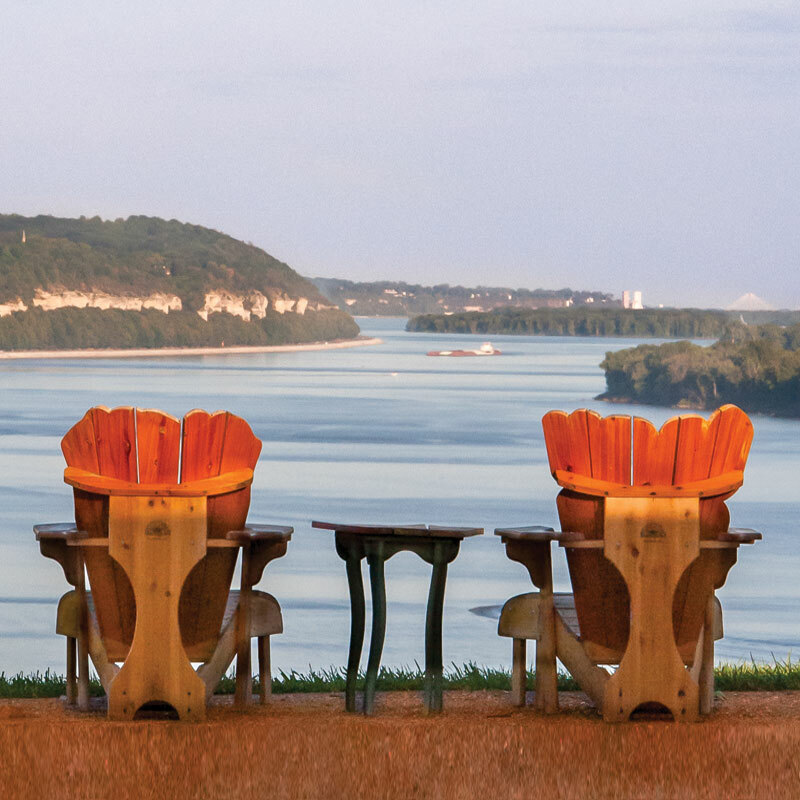 Driving north on Route 3 are great views of the mighty Mississippi at River Rock, the Thebes Overlook and Eagle Bend where wintering Canadian geese fly high. 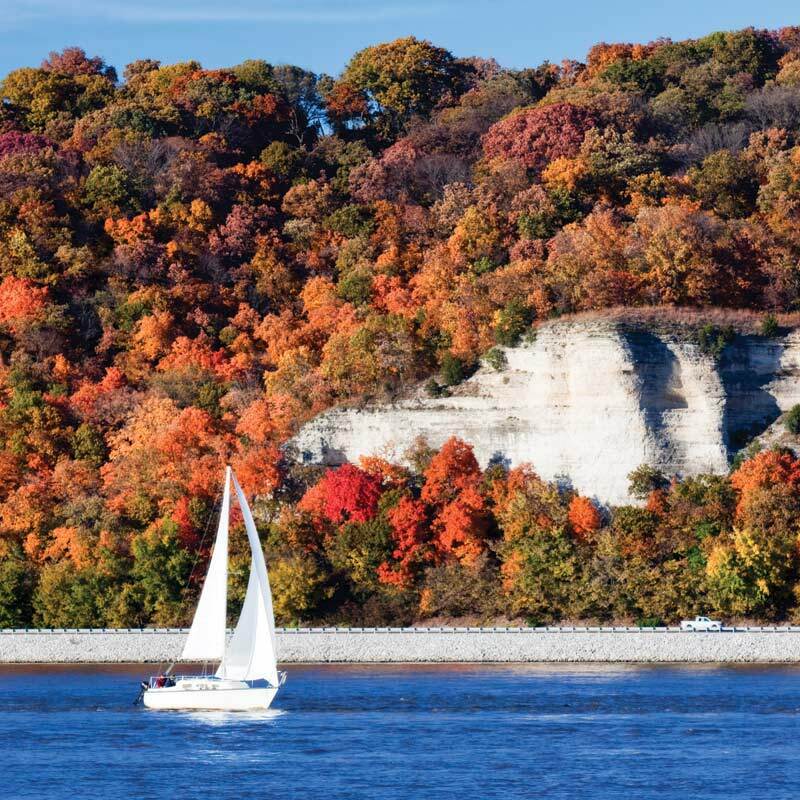 At Grand Tower, the Devil’s Backbone Park overlooking the river is pocked with caves where river pirates hid out until they were rousted in 1803 by troops from Fort Kaskaskia. The Carbondale/Murphysboro area east of the Byway on Route 149 features the Pomona Natural Bridge and the Little Grand Canyon scenic gateways. Carbondale attractions include the Giant City State Park, African American Museum, the City Arts Gallery, and the William M. Margberg Home. The Lake Murphysboro State Park offers hiking, fishing, and picnicking. The Kinkaid Lake, Johnson Creek, and Turkey Bluff Recreation and Wildlife Areas on the way north to Chester are readily accessible to Byway travelers. At Chester they’ll meet up with Popeye the Sailor and learn all about the famous comic strip tough guy at the aptly-named Spinach Can Collectible’s Museum. which played such an important role in the Lewis & Clark Expedition is located upriver at Ellis Grove. Also located there is the Pierre Menard House State Historic Site, Illinois’ first Lt. Governor when Kaskaskia was Illinois’ first State Capitol. Fort de Chartres, built in 1753 on the river west of Prairie du Rocker, and Ruma on Route 155, were key sites during the French Colonial days. Visitors can also see the Kaskaskia Bell State Historic Site with the “Liberty Bell of the West” adjacent to the Church of Immaculate Conception. The Kaskaskia River Fish & Wildlife area east of Red Bud, the Illinois Caverns Natural Area, the Chatlin Bridge Historic District and the Rock Mill and Museum at Maeystown are along the route north to East St. Louis. An array of attractions awaits visitors in the East St. Louis area. They include the Frank Holten State Park, the Gateway Geyser, the Malcolm M. Martin Memorial Park, and the Greater St. Louis Air & Space Museum. At Cahokia visitors can see the Cahokia Courthouse State Historic Site with its Lewis and Clack exhibit and also the Jarrot mansion nearby. Visitors can see the Cahokia Mounds State Historic Site in Collinsville or Horseshoe Lake State Park in Granite City. In Belleville visitors can see the Henry White Experimental Farm, the Schmidt Art Center & Gallery, the Cathedral of St. Peter and the National Shrine of Our Lady of the Snows. At Collinsville visitors can see the world’s largest Catsup Bottle. Edwardsville features the Children’s Museum, the historic 1820 Colonel Benjamin Stephenson House, the Watershed Nature Center, plus one hundred miles of bikeways on the Madison County Bike Trails. Upriver from Alton at Grafton are great outdoor adventures at the Pere Marquette State Park and Visitors Center. Upriver at the mouth of the Missouri River, Hartford and Wood River rightfully claim their designation as Site Number 1 on the Lewis & Clark National Historic Trail, the “Point of Departure” for the Corps of Discovery. 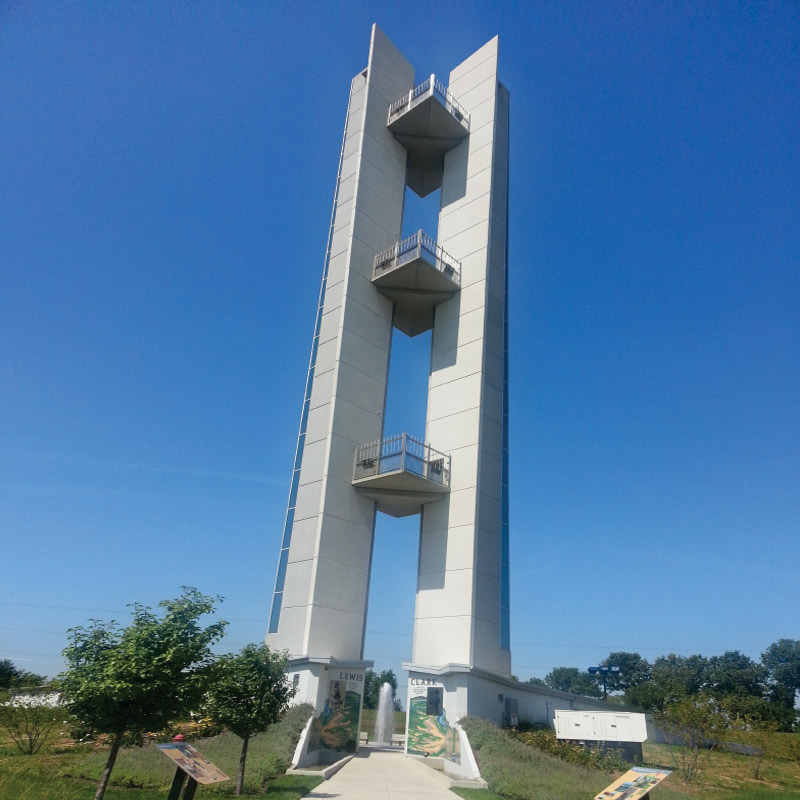 Hartford is marked by the inspiring 150-foot high Confluence Tower where visitors get a spectacular view of the Missouri and Mississippi River Confluence. The tower’s welcome center also serves as the gateway interpretive center for the Meeting of the Great Rivers Scenic Byway, a 33-mile stretch of the Great River Road Scenic Byway filled with natural and historic scenic wonders. 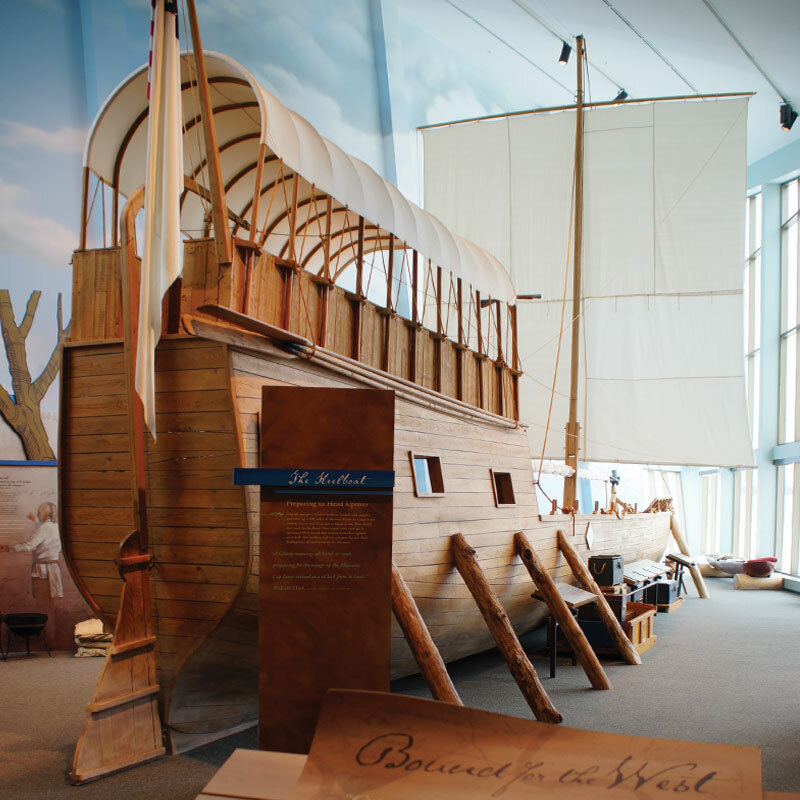 The Lewis & Clark State Historic Site includes the Lewis & Clark Interpretive Center with a full-scale replica of the Lewis & Clark Expedition’s keelboat, a re-constructed Camp River Dubois, their Winter Camp from 1803-04, and exhibits portraying the legacy of Corps of Discovery who in 1804 ventured into the vast wilderness beyond the Mississippi. Camp River Dubois is temporarily closed for repairs, but tours of the cabins and camp area are available. At nearby Wood River you can imagine being a member of Lewis & Clark’s Corps at an authentic full-size re-creation of Camp Dubois near the actual site of the original frontier encampment. The re-created fort provides a unique outdoor venue for groups and weekends. Wood River is rich with area history and has a fascinating Community Heritage Museum and the historic Vaughn Hill Cemetery with Revolutionary War, War of 1812 and Civil War grave sites. The entire family will enjoy Wood River’s Aquatic Center. Nearby Alton has an array of attractions including the Melvin Price Lock and Dam and National Great Rivers Museum, the Alton Museum of History and Art, Alton’s Lincoln and Civil War Legacy Trail, the Lincoln Douglas Square where Abraham Lincoln and Stephen Douglas had their final debate, and the Confederate prison and cemetery. Trail travelers can enjoy great scenic vistas as they bike along Sam Vadalbene Bike Trail, viewing eagles and watching river traffic. The Ellijay P. Lovejoy Memorial, the abolitionists’ newspaper editor, Underground Railroad Tour, and Robert Wadlow Statue, the life-size sculpture of the tallest man in the world, are also at Alton. The Grafton area offers river cruises, parasailing and awesome scenic vistas over the Mississippi, zip lines in the woodlands, a waterpark, and the Mississippi River State Fish and Wildlife Area, plus an outstanding antiques district and wineries. Note: Lewis & Clark Trail visitors traveling south can follow Illinois Auto Tour #2 northeast from Cairo along the Ohio Scenic Byway to the Indiana border.